Vetty Creations are publishers of high quality step-by-step instructional embroidery books. We have two stitch dictionaries and a range of books focusing on historical whitework techniques. All sales are subject to our terms and conditions. Please also read our shipping information. Click on the title or picture for more information about that book. View a turn-the-page preview of this book. A step-by-step stitch dictionary written specifically for left-handers by a left-hander. A step-by-step stitch dictionary that will be your must-have embroidery companion. Whitework embroidery is needlework that is created with white thread on white fabric. Because there is no colour, the texture and patterns of the stitches come to the fore and are displayed in all their radiant beauty. However, many people also enjoy coloured embroidery, and there is always the possibility that whitework embroidery can be adapted into colour, for quite different results. Counted embroidery is where counting of the fabric threads determines the placement of the stitches. The designs are not drawn onto the fabric, rather they are worked from a chart. 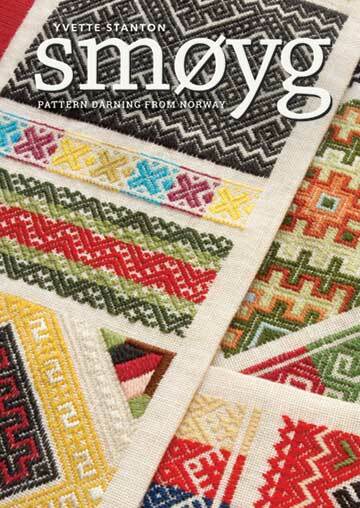 This how-to guide on Smøyg is full of colourful images and enticing projects to help you discover the beauty of traditional Norwegian pattern darning. Pattern darning is a simple counted embroidery technique using basic running stitch, and beginners through to experienced stitchers will find much to delight in this book. This style of embroidery is not complicated. ﻿Taking you back to the Norwegian fjord where it all began... Early-style Hardanger is not often seen outside of Norway, but is quite distinct from contemporary Hardanger. This historical style of embroidery has traditionally been used on the women’s clothing in the Hardangerfjord region, and was designed to emulate needle-made lace of the 1600s and 1700s. View a video book trailer of this book. From the town of Teulada in Sardinia, Italy, comes a beautiful form of whitework embroidery called Punt 'e Nù, featuring geometric designs using a simple knotted stitch. View a video preview of this book. Discover the gorgeous whitework embroidery style from Guimarães in northern Portugal. Drawn thread work combines with bullion knots and eyelets. 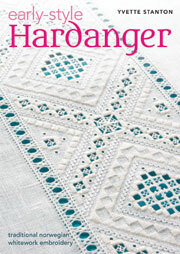 Hardanger embroidery is a whitework counted thread embroidery originating from Norway. Merezhka Poltavska is a whitework counted thread embroidery originating from Poltava in Ukraine. Merezhka is Ukrainian for drawn thread work.